Since 1957, signs bearing the name “Allen Tate” have been widely recognized in front yards throughout the Carolinas. Now the Allen Tate name will be seen along another frequently traveled path – the final section of I-485 in northeast Mecklenburg County. 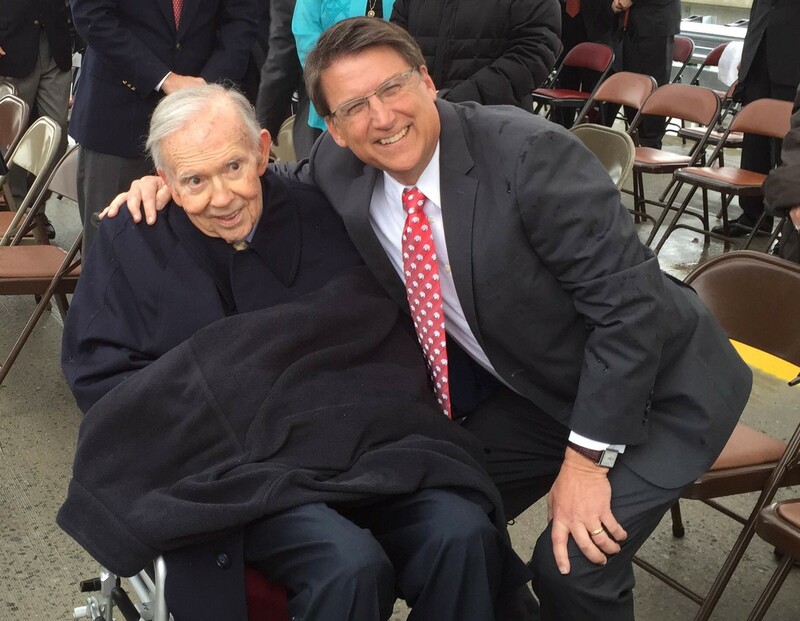 H. Allen Tate, Jr. and North Carolina Governor, Pat McCrory pictured at the ceremony today. Today, the H. Allen Tate, Jr. Highway was officially named in honor of the founder and CEO of Allen Tate Companies and longtime transportation advocate, Allen Tate. The 5.7-mile segment of I-485, which stretches from N.C. 115 (Old Statesville Road) to I-85, completes the 67-mile “outer loop” around Charlotte and connects I-85 to I-77. The “turbine interchange” at I-85 is a design first for North Carolina that improves efficiency, sight distances and safety. This final segment is slated to open in late spring. The ceremony, hosted by the N.C. Department of Transportation and the Charlotte Chamber of Commerce, was attended by state and local dignitaries, colleagues, friends and family members who have been witness to Tate’s tireless efforts as a transportation champion during the past 35 years. “This is an honor beyond description, but it comes along the way. This is not the end of figuring out ways to fill the transportation infrastructure. The trip is not finished – just this project,” said Tate. “From the day I arrived here in November 1991, I rode with Allen on Saturdays, learning where the future transportation corridors of Charlotte would be,” said Pat Riley, president and COO of Allen Tate Companies. “From the other side of my office wall, I’ve witnessed 22 years of relentless transportation coalition-building – so that future generations can look back and say ‘they got it right,’” said Riley. Tate, a Realtor® and developer who founded Allen Tate Companies in 1957, has served as chair of the Charlotte Chamber’s Regional Roads Committee, on the Toll Roads Solutions Committee and most recently, as a member of the Committee of 21. In 2008, Tate led the charge for I-485 to be completed ahead of schedule as well as the widening of I-85 in Cabarrus County and I-485 south of Charlotte. “I am proud of the many people who have worked so hard on this for so many years,” said Tate. “What have we learned from this journey? Do a lot of listening,” said Tate.